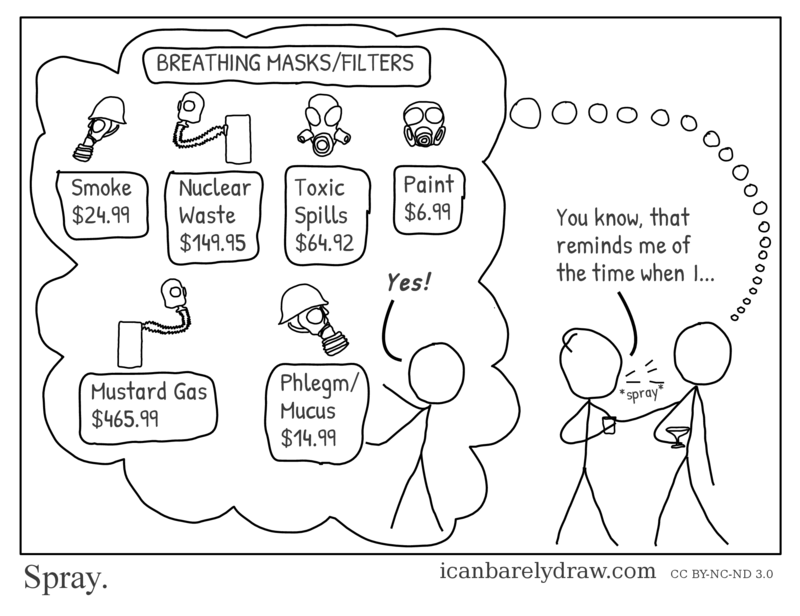 A thought bubble contains a sign at the top that says: BREATHING MASKS/FILTERS. Below this are shown masks, resembling gas masks, of various shapes and sizes. Each has a descriptive price tag below it. In order, these are: Smoke $24.99; Nuclear Waste $149.95; Toxic Spills $64.92; Paint $6.99; Mustard Gas $465.99; Phlegm/Mucus $14.99. A man stands, also inside the main thought bubble, next to the Phlegm/Mucus mask. Outside the thought bubble that contains the scene described above, two men are seen standing, each holding a drink. The first of these two men is speaking, leaning forward to touch the upper arm of the second man and, as indicated graphically and by the word *spray*, apparently spraying saliva towards the second man. The second of the two men leans back slightly. A string of tiny bubbles connects him to the thought bubble described above.